Yahoo! Axis, a unique search browser for iOS has just been released that brings one of a kind browsing experience to the world’s most popular mobile platform. Available for download in the App Store (U.S. only) as a universal binary for iPhone and iPad, Axis does not return a list of links for your searches, but rather shows webpage image previews optimized for touchscreen navigation. It even works with your favorite desktop browsers (via a plug-in) to automatically connect and sync your search experiences across all your devices. So if you set a bookmark on your iPad, it will automatically appear on your iPhone and desktop. Yahoo! Axis is a new browser that redefines what it means to search and browse the web on your iPhone, iPad, and even your desktop. Axis offers the only one-step search experience that allows you to enter your search, see and interact with the results, and find what you need without ever leaving the page you are on. Plus, it includes rich, visual snapshots of each result so you can preview the site before you visit it. Axis finds your answers fast and always keeps you moving forward. Axis gives you instant answers so you can continuously discover and explore content without interruption. 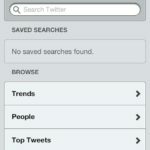 You will never have to leave the page you are on to view your search results again. Axis allows you to pick up wherever you left off as you move across your desktop, iPhone, and iPad. 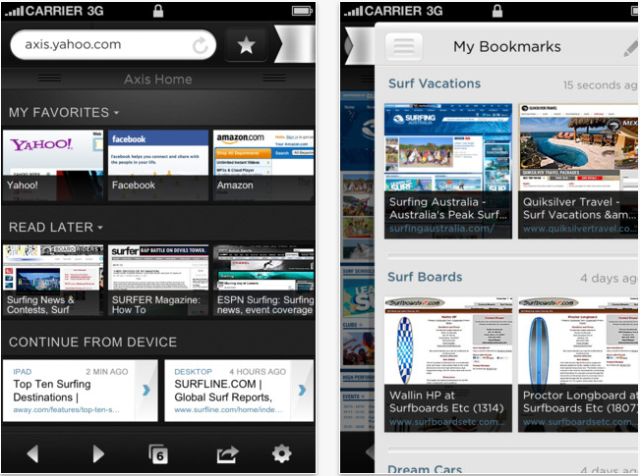 It makes your recently visited sites, saved articles, and bookmarks automatically accessible across all your devices. Axis centralizes your online life with a customizable Home Page that provides direct access to your favorite sites and content across all your devices.